We have over fifty years of experience! EMS Detergent Services manufactures high quality, economical products for various cleaning needs to suit any business and budget. 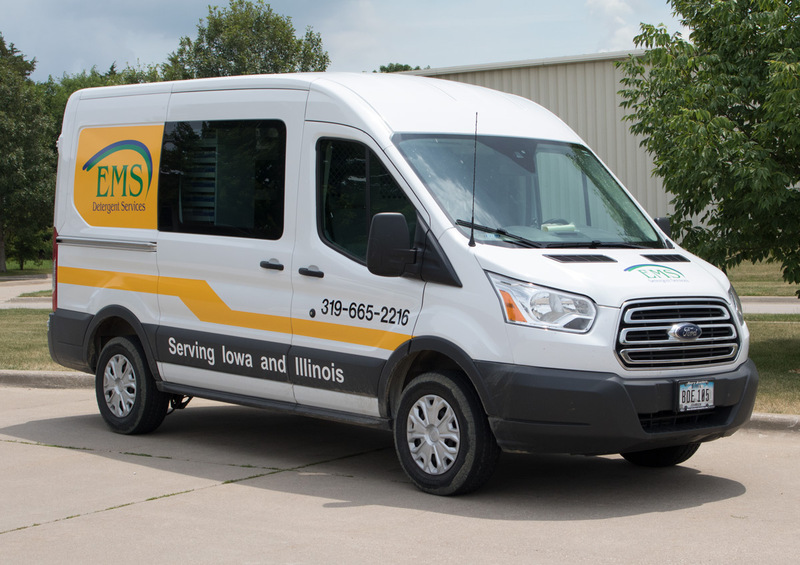 We provide our products and services throughout Iowa and Illinois to bakeries, caterers, care facilities, casinos, churches, correctional facilities, hotels, restaurants, schools, universities, and many more. We manufacture commercial cleaning products for use in the kitchen, laundry, housekeeping, janitorial, brewery, car washing, and further cleaning needs. Along with our products, we have an assortment of easy-to-use, cost-effective, commercial dishwashers and glasswashers available for lease or purchase, new or refurbishes, that will ensure your dishware, glassware, and silverware are clean and sanitizer, saving your employees time and ultimately your business money. To streamline the use of your kitchen, even more, we have dish racks, stainless steel tables, pre-spray assemblies, shelving, scrap traps, and other equipment available. With EMS, a committed Representative, assigned to your business, will provide, in-person consultations, services, and deliveries every four weeks, or as needed depending on sales volume. During this time necessary preventative maintenance will be performed, and needed repairs to equipment, if the required parts are available. Your Representative will also, monitor chlorine precision, hard water, and product inventory, delivering based on past usage amounts. Our service technicians are available 24/7/365 for step-by-step troubleshooting or on-site emergency service. At EMS, we work hand in hand with our customers and focus on building a reputation for quality, customer-valued, affordable services and products. We strive to be our customer’s one-stop commercial cleaning supplier, producing innovative chemicals. If you have any questions or concerns, please do not hesitate to call our office or send us an email.